Miss Gwendolyn is two months old! Ah, those cheeks! I love those kissable little cheeks. She is getting so big, so fast! I probably just forget, but it seems like she's growing even faster than Wyatt did. I tried to put one of her 0-3 month sleepers on her the other day, and it was almost too short! I refuse to break out the 3-6 month clothes yet though. I'm not sure of her exact weight and height, but we'll find out this Friday at her doctor's appointment. I still have not figured out the food allergy thing. She'll be fine for days or weeks at a time, and then randomly have issues again, and I can't figure out what it's related to. I'm still thinking some kind of nut, but I'm not sure. I feel like there's no real pattern. I think I need to start keeping a food diary so we can really figure it out. The funnest thing this month is that Gwen started smiling! I think her first smile that we recognized as the real deal was on February 6th, and in the last week she's gotten so much more smiley! I love seeing her little eyes light up when she smiles at me. Sleep has been pretty good, she'll usually go 6-7 hours for the first stretch at night, and 3-4 hours for the second. I'm just glad to see some improvement from last month - for a while there I was wondering if we'd ever get past 4 hours, but she did! There have been a couple times when she went 7 1/2 hours - so close to "sleeping though the night", but they were just flukes. Hopefully soon though. We haven't been doing much tummy time, because Gwen was spending the whole time with her head buried in the floor, crying. She's getting better though - yesterday she was actually happy just looking around for several minutes! She's a dramatic little thing! Sometimes she'll give out long wail-cries, just to let us know that she's really upset. It's so sad! She's been talking and cooing more this month though, which is such a sweet sound - I love it. She still hates baths, but she hates them less when she's not also hungry. Her new favorite thing is the swing. She didn't like it much the first month, but now it's her favorite place to be, besides in someone's arms. It's been fun to see the development between Wyatt and Gwen this month - he gives her kisses now! One day he was just looking at Gwen and I asked if he wanted to give her a kiss. I thought he was going to give his shy grin and walk away again, but instead he grinned and then leaned his cheek against Gwen's head (which is his way of giving a kiss)! It was adorable. Her first kiss (from another kid, that is - all the adults in our family kiss her all the time). Sometimes he'll randomly walk up and "kiss" Gwen. The other night I was putting Wyatt to bed, and I picked Gwen up to carry her out with me, and as we were leaving Wyatt pointed to Gwen and said "Kiss?" So I had to bring her back so he could give her a goodnight kiss! It was so sweet! He loves her, and I think it'll be fun to watch as she gets older and can interact with him too. One of my favorite things is snuggling with Gwen's face up close to my neck. She'll snuggle her little nose against my neck, and grab onto my hair with both hands, and she won't let go until I force her to. It melts my heart, and it's one of those things I always want to remember - how it felt to have her snuggle so close and hold on tight to my hair. Sometimes I just look at Wyatt and Gwen and wonder at the fact that this is my life. I feel so blessed to have these two as my kids, and I'm trying to cherish all these snuggles from Gwen. I know now from experience with Wyatt that it really does go by too fast. My, you are a darling little thing! Your smiles just make my heart leap, Baby Girl - I can't even describe to you. They make me feel like the most special lady in the world. You still love to snuggle, but you are enjoying your swing more too, and it's fun for me to watch you just look around and observe from your little perch. Your personality is starting to show through this month, and I love seeing it develop. You talk and "coo" sometimes now when you are happy and when you are hungry, like you are trying so hard to communicate. You get upset if you don't see anyone around you, as though you think we left to do something fun without you, and you let us know that you are not happy! I know you're just being dramatic though, because when we come back you stop pretty quick. I think it's so sweet and funny! You like to watch Wyatt when he is close by, and he is always climbing up next to you on the couch to keep you company. You love to be around your family, and as long as you know we are close by and haven't forgotten about you, you are happy. I love all your little expressions - the smiles when you see your daddy or me, the curious/concerned look when you are observing, the pouty lip when you are trying to let us know you need something. It's so cute. I'm so grateful that you are my daughter. We are going to have such fun together through the years, I can already tell. Just wait and see, Precious Girl. I love you so much. I have a feeling this is going to be a slow blogging week - I've got a fairly large to-do list to tackle! I started off this morning by crossing one off the list though - I mailed out Gwen's birth announcements! I feel so accomplished I might just be lazy the rest of the day and watch Trouble With The Curve (from Redbox). It's the little things. Anyway, I have several movie-related things running through my head, so bullet points it is. -We rented Here Comes The Boom from Redbox this weekend, and Derek and I loved it! It was a good movie. I wasn't sure what to expect, but the story was good, it was humorous, and there were several positive elements too - like one of the characters talking about the story of Jacob wrestling God in Genesis, and the group praying before the final match. I was wishing we had supported it by seeing it in the theaters! -Speaking of movies and theaters, for the first time in my life I watched the Oscars. Well, part of the Oscars. I watched the red carpet coverage. Did anyone else think Amy Adams looked so sad in her interviews? I don't know what her personality is like normally, but I like her as an actress, so I felt concerned. Her dress was pretty though. And also, I could not take that host - the Seth McFarlane guy. He bothers me. I was offended by the joke about Lincoln's assassination. I don't care if it's been 150 years, it's never going to be appropriate to joke about that. I get the feeling he was trying to offend people though. I changed the channel shortly after, so I don't know what other inappropriate things he said, but I am not a fan. Some movie called Argo won Best Film. I haven't seen it. In fact, I didn't see the majority of the movies they talked about last night. I'm more of a kid's movie fan myself . . . why did I hear nothing about Wreck It Ralph (unless I missed it, since I changed the channel)? That was the last movie I saw in the theaters. No, wait, it was The Hobbit. That was a good movie too (though not a kid's movie - hey!). Overall, I sat down and watched the first half hour of the Oscars and laughed, because it's basically all these movie people getting together and patting themselves on the back, and telling each other how great they are. And from someone who doesn't think most of Hollywood is that great these days, it struck me as funny! Though someone should tell me what that Oscar mystery object was, because that's the only thing I missed that I'm curious about. This concludes my thoughts on the Oscars. -I find it funny that the Fonz in Happy Days was supposed to be this really cool guy, and yet the guy who played him was named Henry Winkler. I like the name Henry Winkler, but I think Fonzie would have thought he was too cool for a normal name like that. In fact, there probably could have been a whole episode with that plot, like the Full House episode where Jesse tries to hide the fact that his real name is Melvin, or Marvin, or something like that. Oh, the irony. Disclaimer: I happen to like all of the names mentioned above - they are good, strong names! In fact Henry is a family name on my side, and I like it a lot. I'm talking about fictional character's opinions of the aforementioned names only. What does this have to do with the previous two points? Well, Henry Winkler played a music teacher in Here Comes The Boom. Other than that, absolutely nothing. It's just been on my mind. -I clearly prefer movies aimed at children and/or older TV shows to most of the junk they make today. Okay, that's it. Glad I got that off my chest. Last weekend we threw a little birthday celebration for Wyatt! This was Wyatt on his actual birthday with his birthday muffin! We got some practice in blowing out candles. I took that picture while also filming Wyatt and singing him happy birthday. 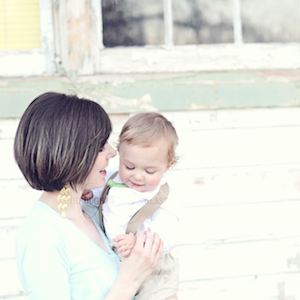 That was my super-mom moment, and I'm pretty proud of it, rare as they are! The rest are pictures from the family party on Saturday! 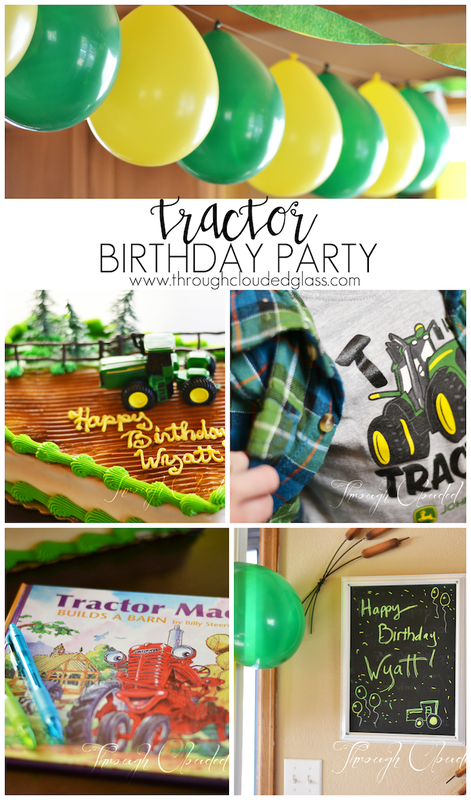 It was pretty low-key, just cake with immediate family, but I decided to do a tractor theme anyway! Wyatt is so into tractors right now, and he loved his tractor cake! I ordered this children's book and had all the family write birthday messages to Wyatt on the inside cover, like a guestbook. I did this last year for Wyatt's first birthday too, and I think it's going to be our birthday tradition. Perfect occasion to wear his tractor shirt! Miss Gwen at her brother's birthday party. . .
Wyatt got lots of great gifts, including a Berenstein Bear book, a movie, clothes, bathtub ships, a tractor flashlight, a horse toy, a "Gator" tractor toy. Derek and I got him a car track (he's also very interested in cars right now), and Derek's family got Wyatt a basketball hoop! A reverse slam dunk . . . He figured out how to throw the ball in the right way pretty quick though! He was so excited to blow the candle out! Gwen was tired out - it cracked us up because she was sleeping with her harms held up un the air like this! Wyatt playing with his new cars! It was a nice time to celebrate with family, to celebrate our two year old! Wow, that's still weird to say . . .